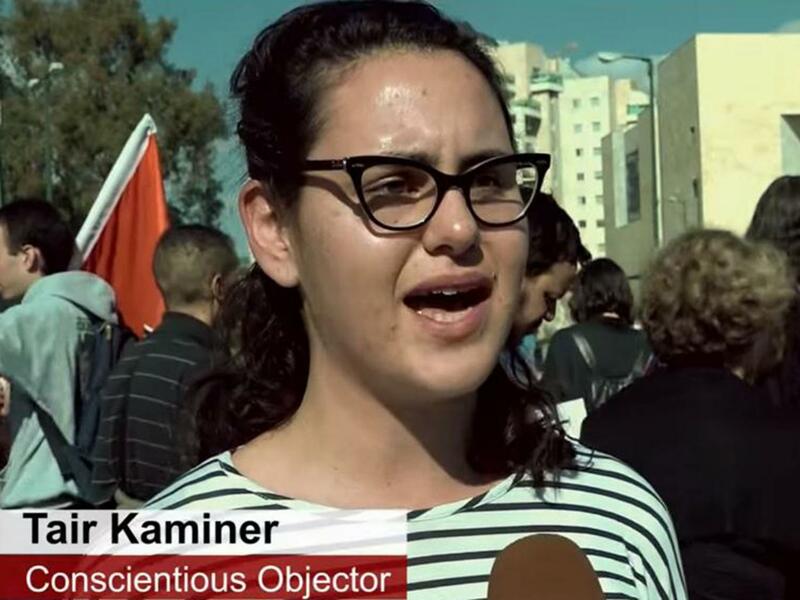 Tair Kaminer, a 19 year old Israeli, has already spent 20 days in a military prison for refusing to serve in the Occupied Territories. She is being hauled up again and faces a repeat of the sentence. Joining her is another 19 year old, Tanya Golan. Caroline Lucas, the Green MP for Brighton has already raised this attack by the Israeli state and army against these brave Israeli teenagers, who have defied the nationalist hysteria and atmosphere engendered by Netanyahu’s racist regime. 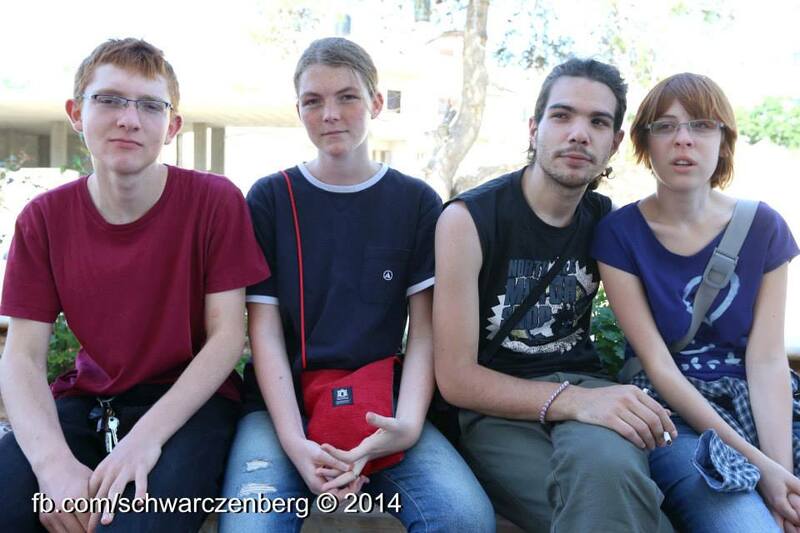 These are the Israelis who we should support. 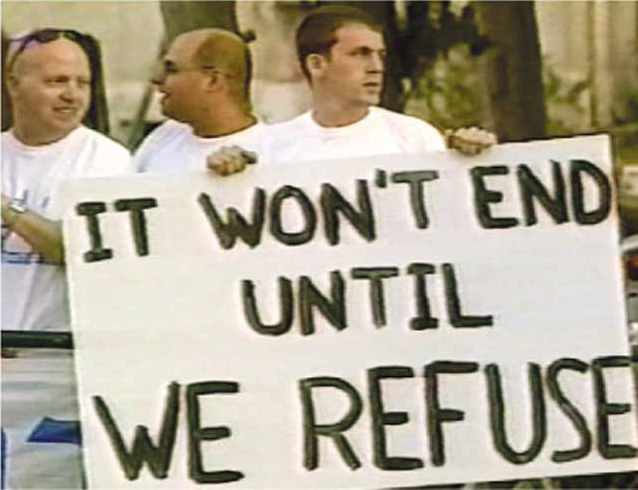 Israelis with a conscience. Those who aren’t prepared to commit more war crimes against the civilian population of the West Bank. Instead our politicians arm Israel to the teeth and repeat slogans about Israel having the most moral army in the world and being the Middle East’s only democracy. It is good that Caroline Lucas has raised this, but why the hell has Jeremy Corbyn not done so? Or perhaps he finds his hands too full appointing Zionists to the Shadow Cabinet to devote time to supporting these two young Israeli women. 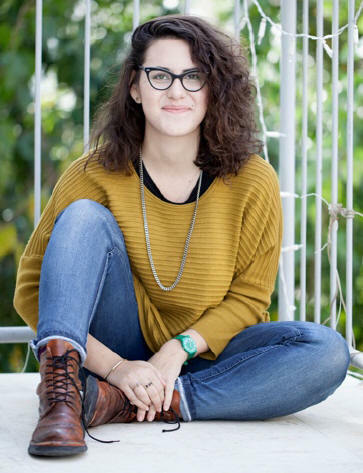 On Sunday (Jan. 31), at 12:00 noon, Tair Kaminer returns to the IDF Induction Center to reaffirm to officers there her intention to refuse service in the IDF. This is after spending 20 days in the military prison. This time she is joined by Tanya Golan, 19 from Beit Shean, who after following the campaign for Tair has decided to make her own refusal to enlist public. Both of them are expected to undergo the army's "disciplinary proceedings" (an "instant trial" by an officer, with no lawyers or witnesses, which usually lasts no more than five to ten minutes) after which they would be sent to the military prison. 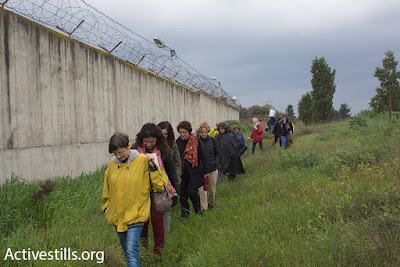 Dozens of demonstrators will be present to accompany the two young women to the gates of the gates of the Induction Center, at Tel Hashomer (east of Tel Aviv) and will call for their release and for the end of the occupation. 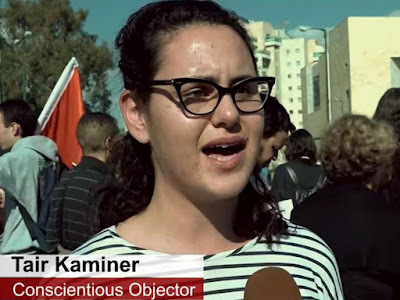 Three weeks ago Tair Kaminer, past volunteer of the Israeli Girl Scouts, 19 yrs old from Tel Aviv, spent 20 days in the military prison for her refusal to serve in an occupying army which is the IDF. Her refusal went viral on social media and initiated posts that were viewed by hundreds of thousands in Israel and around the world. Her incarceration was .ireported by international media and was even debated in the British Parliament, when MP Caroline Lucas called for her immediate release. Tanya: “There are those who are benefiting by the continuation of the Israel- Palestine Conflict and will never willingly give up on the economic control of the Occupied Territories. I refuse to be part of an organisation that executes racist, fascist, discriminatory and oppressive policies". 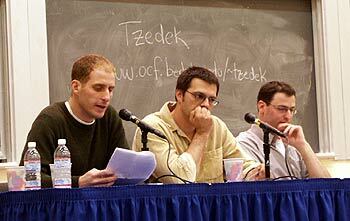 Three Israeli refuseniks, left to right: Ron Gerlitz, a software engineer now living in Cupertino; Ofer Shorr, a translator married to a UC Berkeley graduate student; and Ishai Rosen Zvi, a visiting scholar in Berkeley's Near Eastern Studies department. The demonstration is organised by ‘Mesarvot”- a new political refusal group which connects all of the letters, enterprises and refuseniks from recent years in order to work together. Joining us in this demonstration are other groups such as the Refusers Letter of 2014 and the political organisation “Unity". On sunday (31.1), at 12:00 noon, Tair Kaminer returns to the induction centre to reaffirm her intention not to serve in the IDF, this is after spending 20 days in the military prison. 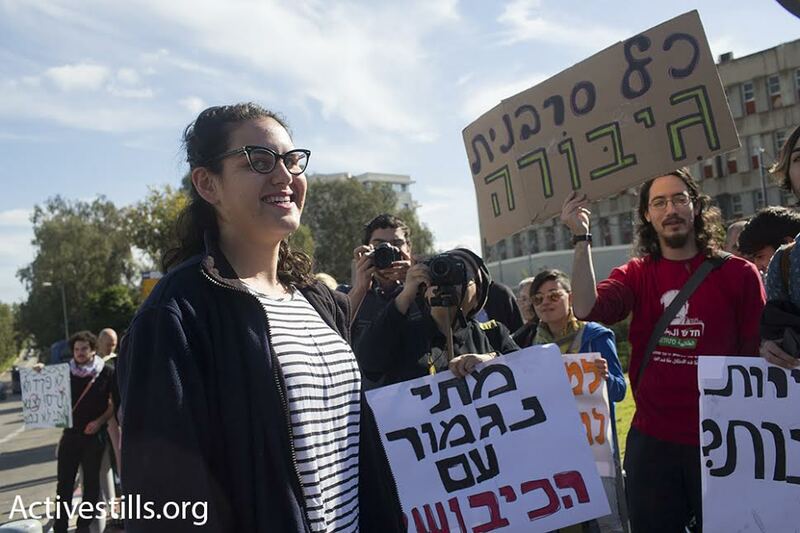 This time she is joined by Tanya Golan, 19 from Beit Shean, who after following the campaign for Tair has also decided to make her refusal public. Both of them are expected to be put on trial and imprisoned. 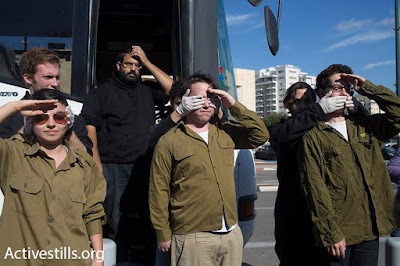 Tens of demonstrators will accompany them on their way and will call for their release and for the end of the occupation. 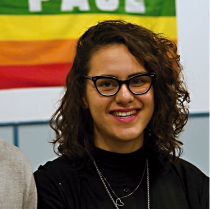 Three weeks ago Tair Kaminer, past volunteer of the scouts, 19 yrs from Tel-Aviv, spent 20 days in the military prison for her refusal to serve in an occupying army which is the IDF. Her refusal went viral on social media and initiated posts that were viewed by hundreds of thousands in Israel and around the world. Her incarceration was reviewed by international media and was even discussed in the British parliament, when Caroline Lucas called for her immediate release. The demonstration is organised by ‘Mesarvot”- a new political refusal group which connects all of the letters, enterprises and refuseniks from recent years in order to work together. Joining us in this demonstration are other groups such as the refusers letter of 2014 and the political organisation “Unity”. 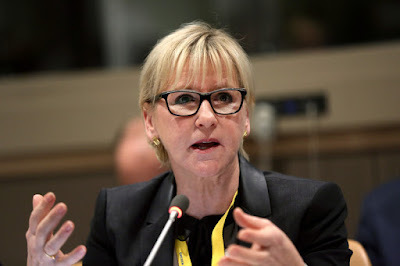 In this article from Electronic Intifada we learn of death threats to the Swedish Foreign Minister from Zvi Zameret, a former official of Israel’s education ministry. In his article Zameret recounts the fate of Count Folke Bernadotte, a Swedish diplomat who was murdered by the Stern Gang/Lehi in Jerusalem in September 1948. Bernadotte had been mediating on behalf of the United Nations over the question of the position of Jerusalem in a settlement. 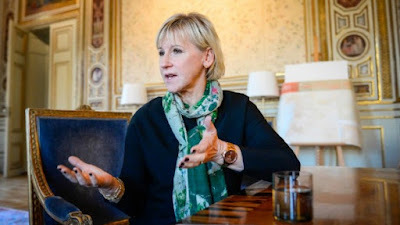 Zameret in his article links what happened to Bernadotte to what might happen to Margot Walstrom, the Swedish Foreign Minister. Walstrom had previously condemned Israel’s use of extra-judicial execution of Palestinians only to be denounced by Netanyahu. 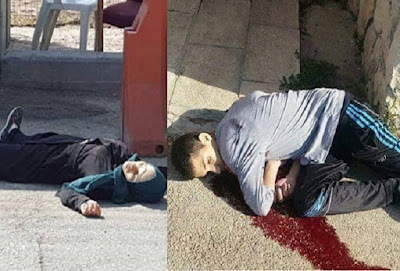 See In 2016 one doesn’thave to be Adolf Eichmann to be executed in Israel – it’s enough to be a teenage Palestinian girl with scissors She was met by the normal hysterical denunciation by Netanyahu. She was ‘stupid and outrageous’ for condemning Israel’s death squads even though it is advocated by Israeli government ministers that someone possessing a knife or even a pair of scissors, regardless of whether they pose a threat or not, should be killed. Contrast this with a certain Yishai Schlissel, a religious madmen who had already served 10 years for stabbing people at the 2005 Jerusalem Gay Pride march. Ten years later, having only just been released 3 weeks before, he was allowed to wander into the Gay Pride march by the Police unhindered. Given he was dressed as an ultra-orthodox Haredi Jew, who are uniformly hostile to gay rights, this was in itself a strange decision. When he started going on a rampage with a knife Israeli police chased after him and wrestled him to the ground. They did not shoot him in the back because he wasn’t a Palestinian. 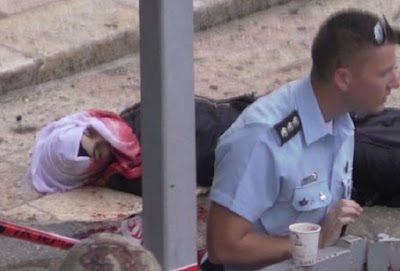 The result was that several people were stabbed and one, Shira Banki was murdered. Although the Supreme Court reversed this decision, on nakedly political grounds viz. 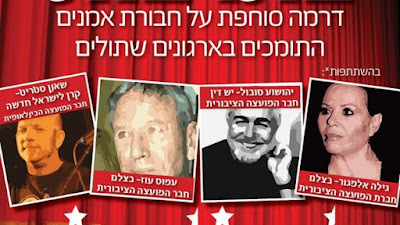 sympathy for its politics, Im Tirtzu has just this past week been accused of being a fascist organisation. 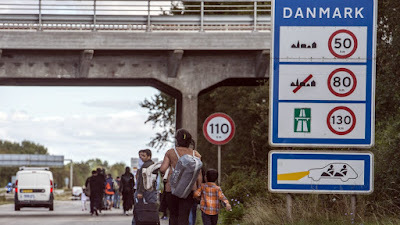 This time even right-wing politicians denounced it. Im Tirtzu decided to launch a campaign against ‘moles in culture’ demonising even left-Zionist poets, actresses and novellists like Amos Oz and David Grossman. They were undermining the nationalist fabric by daring to criticise the Israeli Defence Forces. There is a long and good pedigree for this. The Nazis denounced 'degenerate art' and when they were in power they burned books and art they considered undermined the nationalist and Volkish spirit. None of this has stopped Netanyahu from praising the group. The Egypt Police State is one of the most vicious states in the world. Torture is normal for political activists who are arrested and many activists simply ‘disappear’. It is a state where hundreds of people are sentenced to death at the same time in what is a mockery of the idea of a fair trial. It was no wonder that David Cameron, friend as he is of every tyrant and bloody dictator, welcomed Sisi to this country on November 4th and 5th. Egypt is a close ally of both Israel and the United States. After Israel it receives the largest chunk of US military aid because it is seen as a lynchpin of western imperialist interests in the Middle East. When the democratically elected Muslim Brotherhood President Mohammed Morsi was overthrown by Sisi, the United States deliberately refused to call it a coup d’etat in order to continue the military aid. The Israeli Prime Minister and State was likewise delighted at the coup by Sisi. This has been repaid in a tightening of the siege of Gaza. Egypt has flooded the tunnels from Rafah to Gaza thus doing Israel’s dirty work for it. All of this has been met with approval by the Quisling Palestinian Authority under Abbas. Fateh is in close alliance with Sisi, as it was with his predecessor Hosni Mubarak. The arrest of Dr Taher Mokhtar, a trade union activist, comes therefore as no surprise. It is important that activists and socialists in the West build a campaign calling for his unconditional release from prison. A leading activist in the Egyptian Doctors’ Union was snatched from his home in a dawn raid on 14 January. Dr Taher Mokhtar, a member of the union’s Rights and Freedoms Committee was arrested along with Ahmed Hassan and Hossam al-Din al-Hamady and taken to Abdin police in Cairo for interrogation by National Security officers. Their detention was renewed for four days on 15 January in order to give prosecutors more time to interrogate them on charges of “possessing publications calling for the overthrow of the regime”. Taher is a well-known health activist and one of the organisers of the doctors’ strikes of 2011-2014. 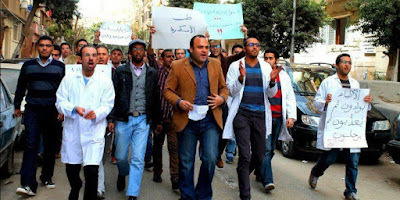 The revolution of 2011 sparked a wave of organising in public hospitals across Egypt, with doctors leading the fight to win increased funding for public health care and better conditions for health workers through a series of major strikes. Taher was elected onto the Higher Strike Committee for the 2012 and 2014 national strikes, which saw thousands of doctors take partial action to demand the implementation of a national pay scale and a rise in the health budget. He has also played a key role in campaigns to win justice for victims of police violence, including Khaled Said, the young man whose murder in an Alexandrian internet cafe in 2010 shocked Egypt. Taher was badly beaten by the police in December 2013 who attacked a small, peaceful protest calling for justice for Khaled Said outside the court hearing against his killers. When Taher’s friend and fellow activist, lawyer and Revolutionary Socialist Mahienour el-Masry was handed a jail sentence for taking part in the protest and he has campaigned tirelessly for her release. Mahienour was just one of the many political activists Taher has fought to free, however. He has spoken out against the repression of opposition across the political spectrum, condemning the use of military trials, torture and forced disappearances by Sisi’s military regime as it attempts to stifle all dissent. 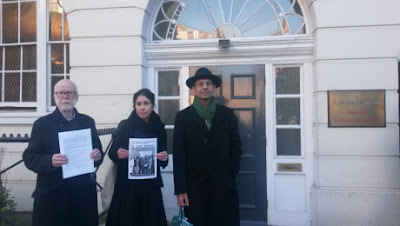 Dr Ron Singer, Chair of the Medical Practitioners’ Union, Dr Mona Kamal Ahmed and Dr Kambiz Boomla delivered letter signed by over 200 doctors, nurses, academics and trade unionists to the Egyptian embassy in London yesterday in protest at the detention of Dr Taher Mokhtar, an activist within the Egyptian Doctors’ Union and a campaigner for the rights of political prisoners. Medical practitioners from the UK, USA, the Netherlands, Greece and Ireland are among the signatories to the letter, which calls of Mokhtar’s immediate release, following his arrest on 14 January. According to his lawyers, Mokhtar is facing charges related to possessing leaflets opposing the current military regime. Embassy staff appeared confused by the delivery of the statement, at one point accepting the envelope addressed to the Ambassador before then returning it saying they refused to accept a delivery in person and asked for it to be sent in the post. Leaders of the BMA’s Junior Doctors’ strike, including Dr Yannis Gourtsoyannis and Dr Jeeves Wijesuriya are backing the statement, alongside Danielle Tiplady of the student nurses’ NHS bursary campaign. “As a fellow doctor and Egyptian citizen I owe a debt of gratitude to Taher Mokhtar- for his campaigns to improve public health care in Egypt and to improve conditions for health workers, and particularly for his courage in seeking justice for victims of police violence. 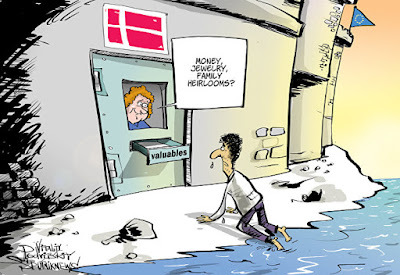 As this cartoon from Steven Bell shows, the decision by the Danish state to strip refugees of all valuables brings to mind the treatment of Jewish deportees by the Nazis. This is especially shameful given the heroic record of Danish people during the second world war when the vast majority of Danish Jews were saved from deportation to an extermination camp through the evacuation of all but 464 Jews to Sweden by boat. The remainder of the Jews were deported to the 'model' concentration camp of Theresienstadt in what is now the Czech Republic. 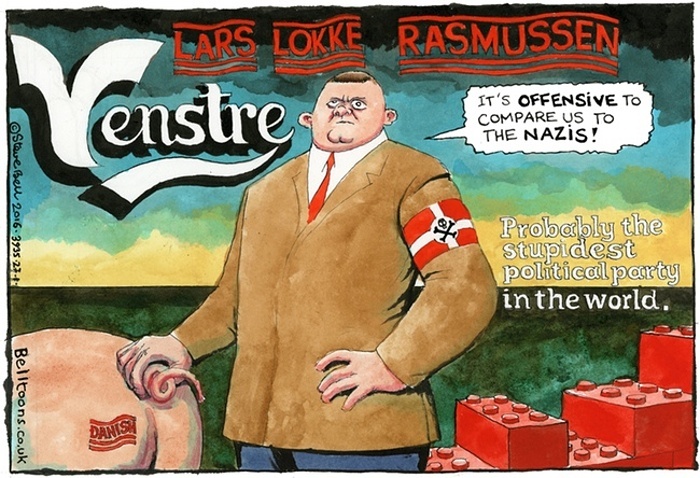 Because of Danish oversight and persistence, none of those in Theresienstadt were sent on to Auschwitz. Below is a report on PSC AGM by Gerry Downing. It is fine as it goes but fails to draw out many of the political conclusions from this year’s event. I moved a motion on Prevent and the Counter-Terrorism Act 2015. The Executive had presented a motion on the Counter-Terrorism Act which failed to mention anything about the Act or indeed Prevent. To call it pathetically weak would be an understatement. I therefore moved the following motion, which was seconded by Clayton Doyle of Manchester PSC. It was supported both by Brighton and Waltham Forest PSCs. I am copying it below for people’s edification. What were PSC Executive’s objections to our motion? Well they objected to stating that Hamas, Hezbollah and the PKK weren’t terrorist. No one of course believes that they are but they spuriously suggested that because the political wings weren’t proscribed, therefore everything was fine. But there have been government attempts to proscribe the Egyptian Muslim Brotherhood. Terrorism is being redefined as essentially any armed group that the West opposes. There is no pretence at any objective definition. Thus it was sheer political cowardice. 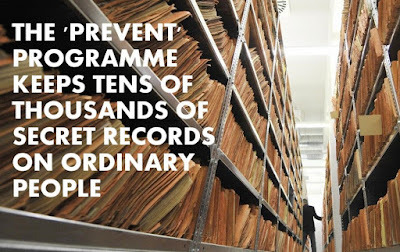 The most amusing objection came to affiliating to People Against Prevent. ‘We don’t know who they are’ ‘we don’t affiliate to any groups’ proclaimed the Chairperson, Hugh Lanning. As I said in reply, if we don’t then it’s about time we did. 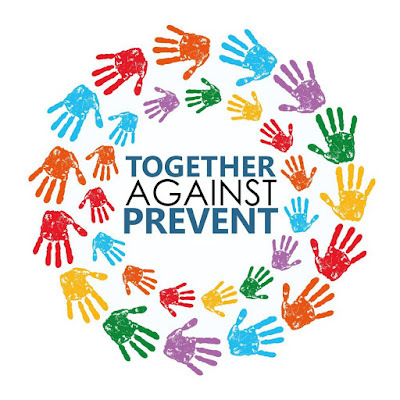 Who Together Against Prevent are can easily be found here. There are 3 PSC branches, a couple of UCU branches and the National Union of Students affiliated, plus numerous community groups. It is true that there is a need for more trade union branches and unions but that is where PSC could help. Instead it chose, out of total political cowardice and inertia, to do nothing. The irony is that PSC’s main objective in the Conference documentation was to ‘Build alliances for political action’ yet the reality is that PSC Executive, which is dominated by the Socialist Action/Socialist League groups, is afraid of its own shadow and runs a mile from anything which is too controversial. Despite being nominally Marxist groups in practice they are reformist of a particularly tepid kind. I also spoke in the morning of the conference on the Annual & Action Plans. They are basically a shopping list of the good and great. The problem is that there is no underlying political strategy so PSC’s propaganda is limited to a human rights agenda. PSC does not have an explicitly anti-Zionist politics and thus it has no analysis of the reasons why Palestinians are subjugated and the relationship between that and Zionism. I made a few comments about how we get the same Action Plan dressed up in a few contemporary events reappearing year after year. There is no attempt at a critical self-assessment. The Executive merely praises itself on a job well done and so we go on to the following year repeating what we did the previous year. The idea of asking itself where it went wrong and what it got right is alien to it. Another problem is that the AGM as presently constituted is not able to get to grips with the specifics. There are no amendments to the Action Plan nor any real discussion of the minutae. What is need, as a minimum, is for the conference to break down in different groups to discuss different aspects of PSC’s work in the future. In other words a radically different format from that which presently exists. What was most interesting about the Palestinian ‘Ambassador’s’ Manuel Hassasian’s speech was his acceptance that 2 States are dead and his call for a unitary state in the whole of Palestine. Of course this is not the official position of the quisling organisation, the Palestinian Authority, which he represents. PSC however is frightened of even discussing the question of a single state or the fact that 2 states is as dead as a dodo. Instead, for the sake of humouring MPs, it is wedded to the dead in the water 2 states solution. For the same reasons it has no perspective on the wider Middle East despite the fact that without change in the Arab East there is no possibility of change in Israel/Palestine itself. In short it was, once again, a disappointing AGM. 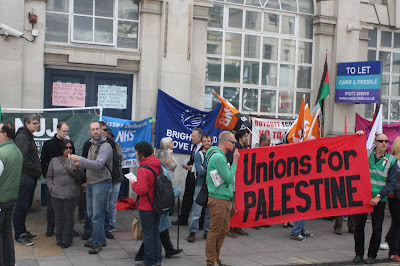 PSC is the largest solidarity organisation in Britain, with over 5,000 members. 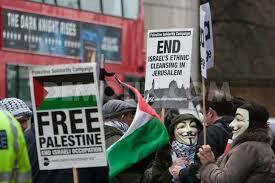 It should be spearheading the attack on Zionism in Britain. Instead it is content to put over a broad but depoliticised human rights agenda on behalf of the Palestinians to MPs and those in power. It avoids like the plague all political questions such as the nature of the Jewish state and Zionism. Those to the left of PSC have been content to organise in direct action groups like the Boycott Israel Network. This is fine but it also avoids the central problem of PSC’s politics. It is appealing to a constituency of MPs who are motivated, not by human rights or justice, but the foreign policy needs of the British State. About 350 delegates attended the AGM, according to the PSC website but the only counted vote recorded 76 for and 116 against with several delegates holding two and, in one case I noted, three voting cards – apparently you got a red card vote as an individual member and one as a delegate from a local group or a blue vote additionally as a delegate from a national organisation. Don’t know what the three red card votes was about. Financially the PSC is in very good shape, the global reaction at the mass bombing of Gaza in July 2014, Operation Protective Edge, was such that a very high level of donations and affiliations continues, unlike the fall-off after previous IDF outrages like Operation Cast Lead on 2008/9. PSC has recruited extra staff and ended the year with a healthy surplus. There were only 6 motions from the 62 branches, not an indication of a very politically engaged base. No need for a compositing committee here, with all its bureaucratic implication. These motions were taken around the discussion on the 4 Objectives for the coming year, which was a good way of doing it. 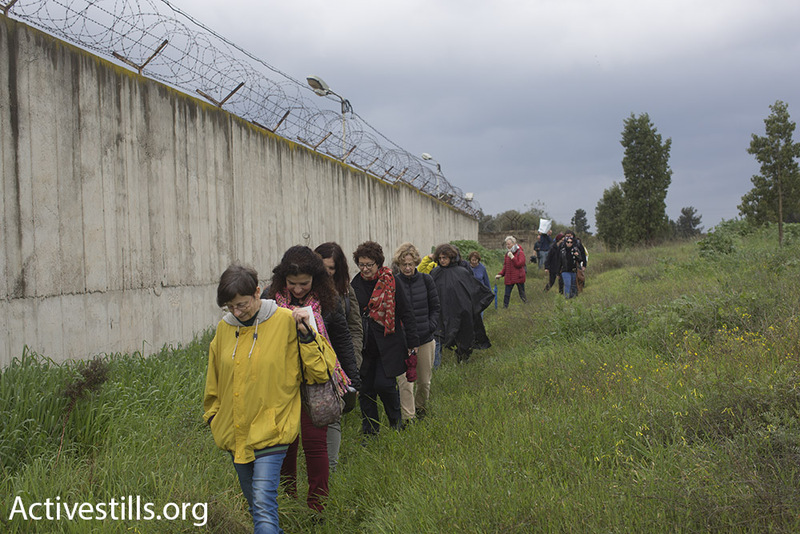 Objective 1 was the colonial settlements, Nakba – a week for Palestine, culminating in a national event on Sunday 15 May, as in previous years, and the siege of Gaza. There were two motions taken here, Motions 2, condemning Israel’s appalling attacks on their Bedouin citizens in the Negev desert. In particular the 90 times the village of Al Arakib was demolished only to rise again dues to the determination of its inhabitants, who are now forced to live in the cemetery, whose earliest gravestone prove that it has existed there since 1913. 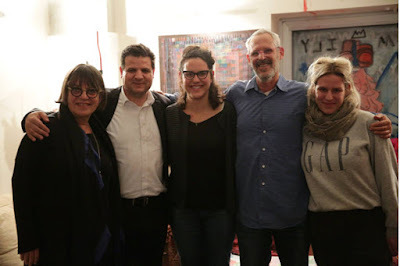 And the AGM pledged solidarity with the village of Umm el-Hiran, which is scheduled to be demolished and replaced by an Israeli Jewish village of the same name in the same place, despite the fact the Negev is 4,700 square miles; over half of area of Israel. Of course it is not a desert at all in places or people could not live there. One delegate condemned the developing practice of replacing road signs with the Israeli name in Hebrew and Arabic but the Palestinian name no longer appears, their very name for their own places is no longer recognised by Israel. This motion was passed unanimously with many moving speeches in favour and none against. The second motion here was the Red Card for Israeli Racism, with the attempt to get FIFA to suspend Israeli membership. The motion condemned restrictions on the movement of Palestinian players, staff and officials and egregious racism on the part of Israeli football officials and clubs. In particular the Israeli Football Association tolerance of the situation at Beitar Jerusalem FC, where a long-standing unofficial ban on Palestinians players is combined with violent fascism on the part of its supporters. This motion was also passed unanimously, although the suggestion of one delegate that Palestine be allowed into the Eurovision song contest went down like the proverbial lead balloon. Then followed the elections for the Executive committee. All the existing Officer places were filled without contest and 8 were elected from the 12 nominations from the membership. One candidate apologised for being white but did point out that he was both gay and disabled so we should vote for him. I did not in a very politically motivated anti-sectionalism huff. And I did not vote for those who were not at the meeting or who made no political statement whatsoever apart from how experienced and good they were at their jobs. Of course one needs to know more about candidates but left with no other way of deciding and not yet being engaged in the internal politics of the PSC that was my only option. 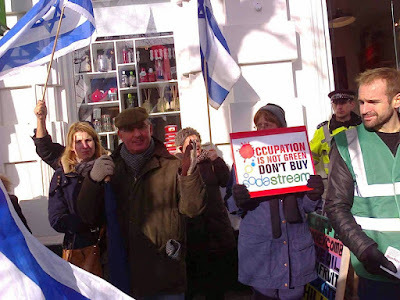 There was no obvious oppositionist like Tony Greenstein on the list. Significantly this was the result of an appeal from the Palestinian General Federation of Trade Unions (PGFTU), the General Union of Palestinian Workers (GUPW), the Federation of Independent Trade Unions (IFU), and eleven other Palestinian union and labour movement organisations. It was a global labour movement action which showed their power. In fact there was no labour movement orientation and no recognition of the global working class as central agents of revolution and those with the direct potential to isolate and defeat the Israeli state. Next came the major oppositional debate on Motion 1 on the Government attacks on solidarity – the Counter Extremism Bill. The motion itself was unobjectionable but very weak hence the amendment propose by Tony Greenstein and seconded by Clayton Doyle. 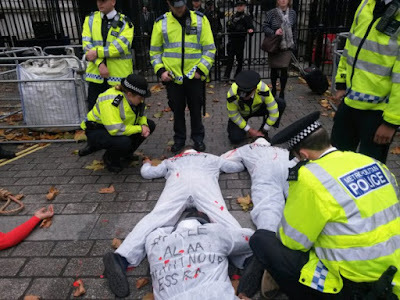 This was opposed by the Executive on many counts but really what they found absolutely unacceptable was the sentences, “We reject the labelling of Hamas, Hezbollah and the Kurdish Workers Party (PKK) as terrorists. This does not mean that PSC agrees politically with any or all of the above organisations.” The PKK had nothing to do with Palestine so why should we bother with those? asked one PSC leader. Also objectionable was the proposal to affiliate to ‘Together Against Prevent’ – the PSC does not affiliate to any organisation, they said and the only way to fight Prevent was legally, we had already learned from the Objectives. 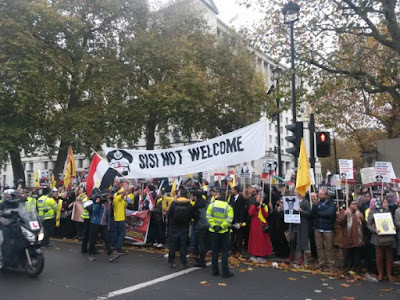 The implicit motivation for rejecting the label terrorists for Hezbollah was an event that happened at demo outside the Israeli Embassy on 17 October 2015. The 5 Pillars website reported on the incident. Here the PSC leadership objected to the presence of the flag of Hezbollah and some present attempted to remove it, the flag poles were broken. Subsequently the police were called, the two flag holders, Abbas Ali and Antonio Maniscalco, were arrested for disrupting the peace and for supporting a proscribed terrorist organisation. Ali said that the police had also raided his house and took PCs, laptops and memory cards. Mr Maniscalco’s residence was also raided. I personally witnessed many flags on the protest. The PSC said that only Palestinian national flags would be welcome at the protest but only the Hezbollah met with such fierce opposition. The PSC leadership have neither confirmed nor denied calling the police. The amendment was fiercely attacked by the Executive and just as fiercely defended. The political issues were clear, although both Hamas and Hezbollah were legal political parties they both had military wings who were either ‘terrorists’ according to imperialist propaganda accepted by the PSC Executive or they were freedom fighters according to their opponents who had every right to use violence to defend themselves. The truly shocking notion that only the violence of the oppressor and the slave holder was legitimate and the violence of the oppressed and the slave was totally illegitimate and the actions of ‘terrorists’ was what the conflict was clearly about. The amendment was lost by about 2:1 with no card count. The motion itself was then passed unanimously. Motion 5, to condemn the Co-Operative bank was taken here and it was agreed to pursue legal action and to transfer either to the Unity Trust Bank or to the some other bank that offered a good deal. Passed unanimously. Mustafa Barghouti, General Secretary of the Palestine National Initiative (PNI), a member of the Palestinian Legislative Council since 2006 and is also a member of the Palestine Liberation Organization (PLO) Central Council addressed the meeting through Skype with a moving expose of the shocking actions of the Israeli and the support the Palestinians were gaining for UN membership and rights as a state. Objectives 3, to organise for growth and 4, to build alliances for political growth, were then outlined. One delegate here raised the project of setting up a Conservative (yes, Tory) Friends of Palestine group of MPs and the Executive indicated support for this. Another delegate asked for a fortnightly newsletter to assist activists in their work and the remaining motions were taken. Motion 5, to expel Israel from the United Nations was the other controversial motion. It was moved by Blake Aklcott and seconded by Chris Burns-Cox. It had been referred back from the 2015 AGM by 134 to 74 and it was taken again here. 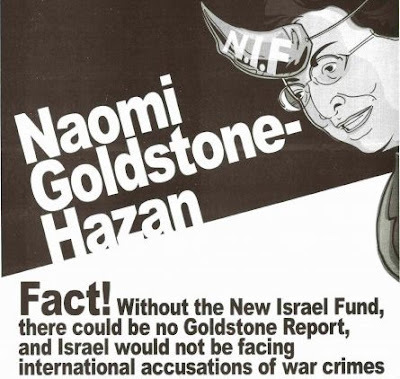 The Executive strongly opposed with the same type of argument used against Tony Greenstein, they agreed with most of the sentiments but they had to build broad alliances and this would alienate the many of those who might support the cause. There was a lot wrong with the motion, its legalism and the illusion that the UN, which had recognised Israel and partitioned Palestine in the first place in 1948 (Joe Stalin first in with recognition there). This could not possible be the vehicle for the liberation of Palestine via a “motion to the Security council recommending that the General Assembly expel Israel in compliance with the Charter, Article 6.” But the motion did represent a progressive impulse to expel and defeat Israel and should have been supported on that basis. And wasn’t is contradictory to be for the inclusion of Palestine and the Expulsion, a PSC leader asked? Not it wasn’t replied a delegate later, both these should be taken together, this happened in 1971 when the United Nations General Assembly recognised the People’s Republic of China (PRC) and expelled Taiwan. Notable in support of the motion was a young Palestinian woman in traditional dress who spoke eloquently and powerfully in support of the motion and a ‘new member’ who opposed the motion on the basis that it was not ‘reasonable or realistic’ – standard Blair-speak for defending the status quo. Nevertheless it was supportable as a democratic demand but not to the PSC executive. This amendment was lost 76 for and 116 against in the only card count of the meeting, including all the multi-votes cast. The concept of unique ‘fundamental British values’ is racist in itself. We uphold universal human values. Prevent claims to ‘“prevent people from being drawn into terrorism” while erroneously attributing terrorism exclusively to ‘extremist’ ideologies. It effectively criminalises political support for liberation movements. It would have outlawed support for the African National Congress in its fight against Apartheid. The Government has proscribed organisations that they oppose politically by deeming them ‘terrorist’. We reject the labelling of Hamas, Hezbollah and the Kurdish Workers Party (PKK) as terrorist. This does not mean that PSC agrees politically with any or all of the above organisations. 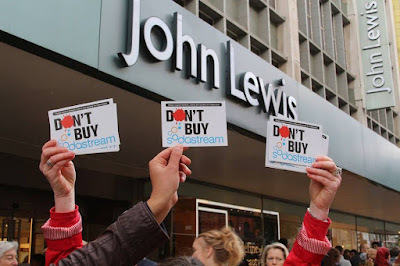 1) Challenge Prevent and the Counter Extremism strategy by forming broad alliances with individuals and organisations determined to defend democratic and civil rights, freedom of expression and the right to take ethical procurement and investment decisions. 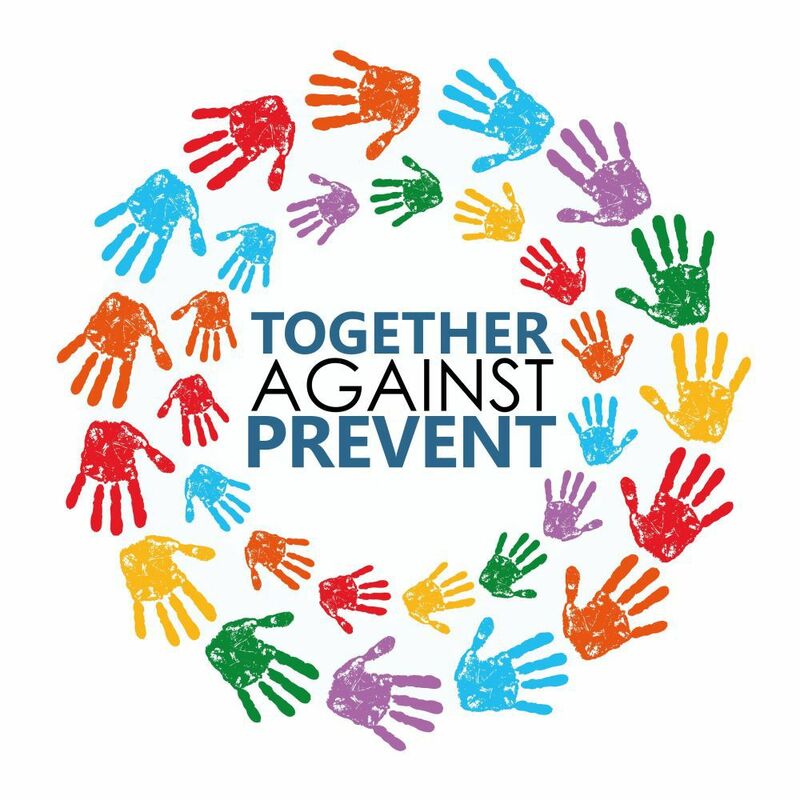 2) Affiliate to 'Together Against Prevent' and encourage its branches, affiliates and partners to follow suit. 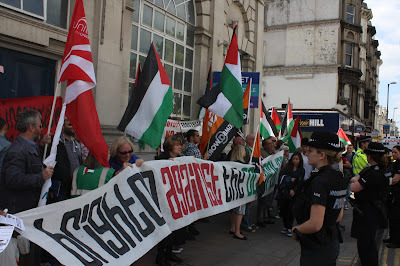 3) Investigate legal avenues to defend our right to campaign for Palestinian rights. This AGM deplores the measures being used in order to silence debate on Palestine and attack ways of demonstrating solidarity with Palestine and putting pressure on Israel – seeking directly to affect our ability to campaign. 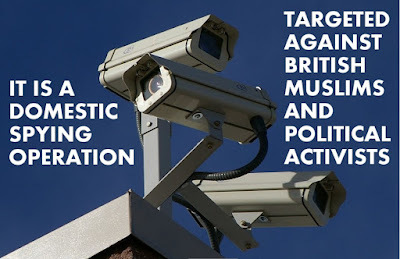 The swathe of anti-democratic measures are being forced through by this government – from the Trade Union bill to the Investigatory Powers Bill and threats to the Human Rights Act. 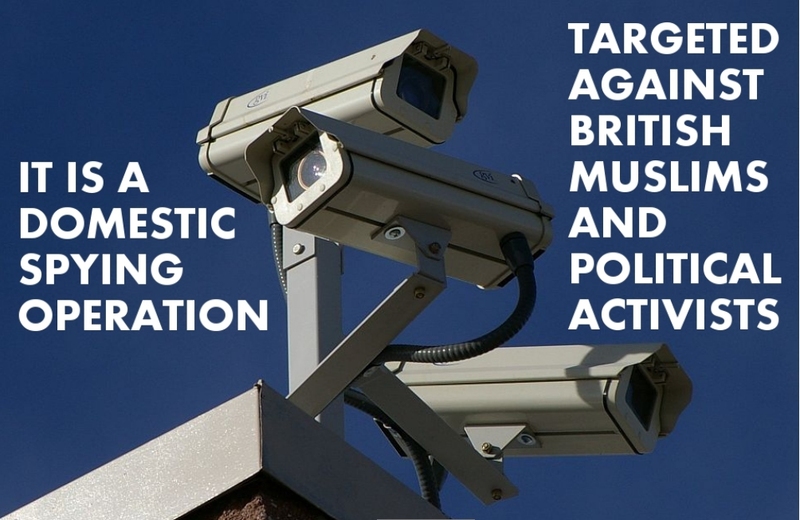 As part of this, the government’s introduction of a Counter Extremism Bill will take these measures even further. The attacks reflect the significant growth of public support for Palestine amongst the British public and an indication of how much impact BDS campaign is making. The anti-Palestinian counter-offensives are trying to overcome the difficulty faced by pro‑Israel groups in winning people over to defend the policies of Israel. These policies are indefensible because they are in breach of international law and Palestinian human rights. The most recent examples of the attacks are the Knesset proposal to ban BDS supporters from entering Israel and the Conservative Party announcing measures preventing local councils from choosing to divest pension funds or not to enter into contracts with companies operating in Israel that are complicit with these policies. 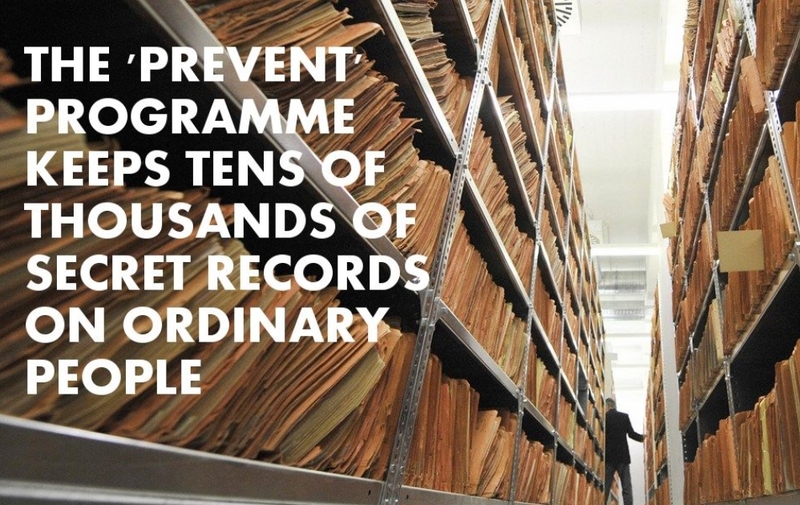 These measures impact on a whole range of organisations, not just the PSC. Therefore it is necessary to challenge by creating a broad alliance opposing these attacks – including anti-racist groups, trade unions, faith organisations and lawyers. The PSC should also work with local government contacts, trade unions and supportive councillors to defend their right to act ethically. The PSC resolves to raise awareness of these attacks, campaign against them, and investigate legal avenues to defend our right to campaign for Palestinian rights.